Semiconductor manufacturers increasingly want precise control of O2 and N2 concentrations in ultrapure water. Specifically, the polishing loop of a semiconductor plant needs to control dissolved O2 to low levels of 1 ppb or 5 ppb while simultaneously controlling the dissolved N2 between 8–12 ppm. When it comes to total gas control, 3M™ Liqui-Cel™ Membrane Contactors are able to remove dissolved O2 down to 1 ppb and then add N2 in a second stage to the desired concentration. 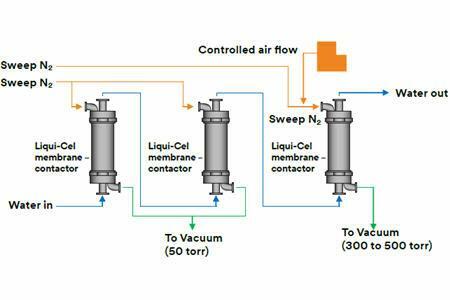 In comparison, vacuum towers are not used to remove and then add dissolved gasses in a single system design.